Horses are social animals for whom biting is a means of developing social status in a herd. When horses bite, they may be asserting their perceived authority, playing, indicating pain or discomfort, or simply searching for a treat. While biting horses may pose danger to their human companions, simple training techniques and consistent, fair handling can discourage the behavior for good. Many horses learn to beg for food due to the practice of hand-feeding. 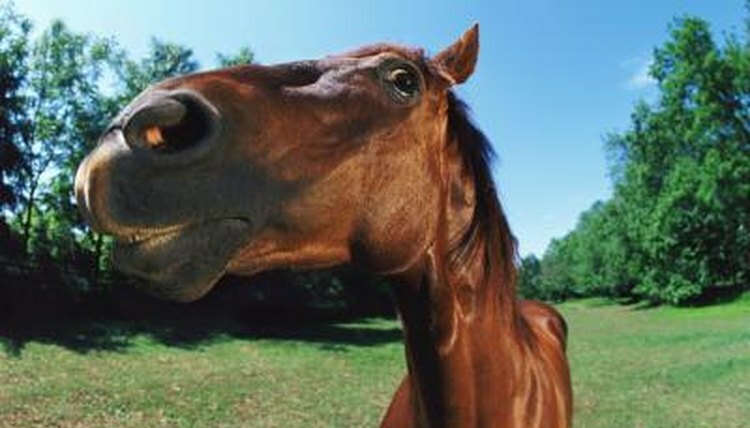 Due to the position of their eyes, horses cannot see objects placed directly in front of their lips and therefore may bite for exploration purposes. Treats, fed by hand or otherwise, is rarely advised; most horses have no true physical need for treats and can develop undesirable behaviors when they learn to seek them out. The safest policy is to place any food item in a flat bucket and allow the horse to enjoy it without any human extremities in the way, according to Dr. Nancy S. Loving on HorseChannel.com. Helping a horse learn respect for humans involves paying attention to his own physical cues and what he is communicating with his body. A horse who pins his ears by flattening them against his neck is in an aggressive mood and may bite to express it. Horses also nip or bite in a herd setting when playing and may come to view this as a pleasurable activity when among human handlers if improperly corrected. A handler may direct the horse to back up or may block him from coming into the handler's personal space. When the horse understands that his human companion is the dominant figure in their relationship, he will respect that person's space and mind his manners. Horses need to recognize human authority. Young horses are particularly mouthy, eager to establish position in the herd. When a horse bites, reprimanding him firmly but fairly will get his respect and attention without frightening him and increasing aggressive behavior. When horses attempt to bite, the handler should send the horse away with assertive body language that mimics the discipline of a dominant horse to his subordinate in a herd situation. Tapping the horse's shoulder can move him away when he is being handled, according to Equestrian Life, particularly when he is being pushy. Horses may bite as an expression of pain or discomfort. A qualified veterinary professional can pinpoint the source of any pain and provide a treatment plan. Improper saddle fit can irritate a horse to the point of biting. Sometimes, the way a horse is handled when he is saddled or ridden can increase unwanted behavior. Learning the sensitive areas of the horse's body can help people avoid them. When horses continue to bite, the help of a professional trainer can assist handlers in isolating the issue and helping to resolve it, according to KBR Horse Net. KBR Horse Net: Horses That Bite!